A while ago French producer and digi maestro Manudigital went to the Caribbean where he recorded yard sessions with both the older and younger generation of reggae artists. These sessions were published on Youtube and most have now been collected on the album Digital Kingston Sessions, a set collecting seven cuts recorded in Jamaica, Mexico and Trinidad & Tobago. This type of reggae – which originated in Jamaica in the mid-80s and went global with King Jammy’s game-changing Sleng Teng riddim – is raw and brash and the rhythms are fun and simple, yet often effective. And for these digital sessions Manudigital has attracted originators like King Kong, Pad Anthony, King Everald and Derrick Parker, singers who recorded many tracks in the mid-80s when the digi craze swept Jamaica. He has also hired Trinidadian performer Queen Omega and she really kills it. She is a truly unique talent with one hell of a voice. Manudigital also recorded Junior Cat, but for some reason that cut didn’t make it onto the album. Make sure to check the single and you’ll be swept away by his fast-chatting style and fashion. On Flash Hit Records’ Time Machine EP they have worked with veteran artists from the early dancehall era and the digital dancehall craze. Papa Michigan, Lieutenant Stitchie, Derrick Parker and Carl Meeks all showcase their talents over explosive riddims created by the team behind Flash Hit Records along with the insanely productive Manudigital, an expert in recreating 80s digital reggae with a contemporary flavour. This short set – four vocal tracks and two instrumentals – is boiling with energy and Lieutenant Stitchie spits lyrics over a crazy, pulsating beat, while Carl Meeks’ dramatic singing bounces over a lively riddim. An excellent introduction to the Flash Hit sound. French singjay Papa Style follows up on his debut album Alma de Guerrero with the ultra-bouncy Turbulent, a ten track set featuring combinations with Jamaican singer King Kong, Brazilian songstress Flavia Coelho and French singer Little Francky. The album is produced by the insanely productive Manudigital along with Massive Boris from French band Danakil. And they have created a playful and contemporary reggae album borrowing heavily from hip-hop. The album also contains a number of vintage vibes. Ce Que L’argent Décide utilizes the chorus from Dennis Brown’s massive Easy Take It Easy and Hors Controle uses parts from Justin Hinds & The Dominoes’ classic Carry Go Bring Home. An energetic and festive album that will light up any dance floor or rainy day. French composer, bass man, producer and mixing engineer Manudigital has become something of an Internet sensation over the past year. It all begun about six months ago when he launched his Back Inna Days series on Youtube. On his popular Youtube channel he showcases his musical skills creating creative digital versions of classic reggae and dancehall riddims. But Manudigital has been involved in the music business for a long time. More than 20 years actually. He started playing the bass at the age of 13 and joined his first reggae band back in 1994. He is a trained musician that has played and toured with French indie reggae band Babylon Circus, but went solo in 2012 to pursue a production career instead. Since then he has become a well-known name in Europe, especially France where he has worked a lot with Biga Ranx. But he has also had projects with labels and artists like Irie Ites, Flash Hit Records, Sizzla, Papa Michigan, Chezidek and several more. But now Manudigital has moved into the spotlight fronting his debut album, which carries collaborations both veterans and newcomers, including gravel-voiced deejay Joseph Cotton, the ever so versatile Soom T and Marina P and the sweet-voiced Sara Lugo. Digital Pixel is a digital affair from start to finish, but where most digital reggae sets tend to be shallow and one dimensional, this fresh set is quite the opposite and Manudigital manages to create several different moods and atmospheres; ranging from party-starters like Joseph Cotton & King Kong’s celebratory Manudigital Affair and Jamalski’s propulsive Bad Boys to Errol Dunkley & Blundetto’s dreamy masterpiece Look at the Tree and Sara Lugo’s beautiful Big Up. Armed with synths, drum machines, effect boxes, talented artists and a musical cleverness Manudigital has created a contemporary digital reggae album with lots of vintage vibes. Pierpoljak is one of the most successful French reggae artists. He dropped his debut album in the mid-90s and has managed to sell both platinum and gold. Over the years he has made many trips to Jamaica to explore culture and music. And his new album Général Indigo got its title from an incident during a visit. According to a press release Pierpoljak was in a parking lot in Kingston, smoking weed and waiting for a friend when a security guard turned up. They argued, but soon made friends, and the security guard christened him General Indigo because of Pierpoljak’s blue eyes. Général Indigo is his tenth album and to have creative freedom Pierpoljak established his own label Garvey Drive. It collects twelve tracks recorded in Paris together with some of the most talented reggae musicians from France, including Bost & Bim, Manudigital, Kubix and TnT. This is warm, emoitional and melancholic roots reggae with the usual messages of freedom, love and unity. But Pierpoljak also get personal on a few cuts. On Papa Du Week-End he sings about parenting and child care, on Keep On Dada – on which he also gets into Burning Spear mode – he criticises the social security system and on Puta Vida Loca he tells the story of a Parisian drifter. The French reggae is one of the hottest in Europe and both veterans and newcomers are putting out excellent roots, dancehall and dub. And after more than 20 years in the industry Pierpoljak still manages to sound relevant. French deejay Biga Ranx rose to prominence back in 2008 when he recorded a combination with gruff Jamaican deejay Joseph Cotton. He released his debut set in 2011, its follow-up two years later and now he has dropped his third album Nightbird. The title is a telling one since this album is dark and melancholic. It’s a subway journey through a desolate city on a late Sunday night. A time when it’s just you, your headphones and Biga Ranx’ tongue twisting vocal delivery. Nightbird is electronic and electrified. It’s digital reggae with a twist. Not aimed at the party, rather for the ride home or for a dozed off after-party. Biga Ranx and producer Manudigital have also accomplished something unique. They have managed to have no less than four legendary Jamaican deejays on the same track. 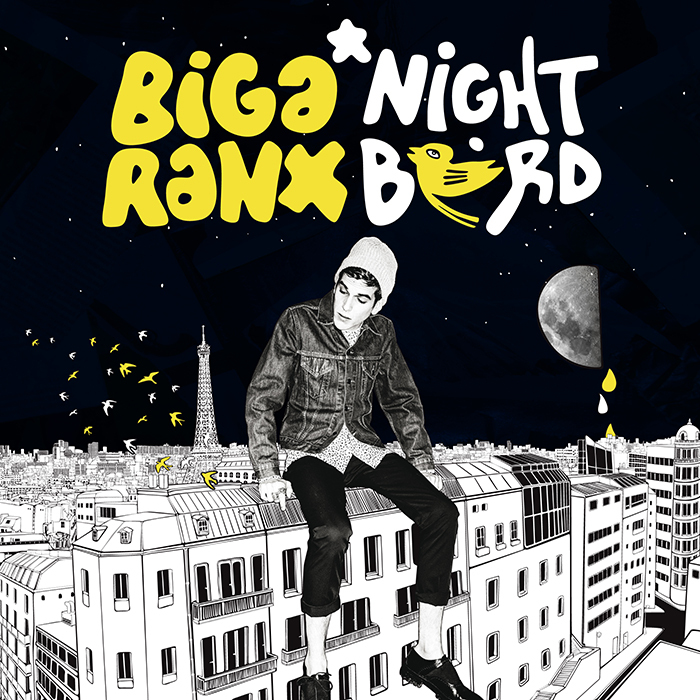 On Hate Biga Ranx teams up with Big Youth, U Roy, U Brown and Joseph Cotton and the result is a great one. It’s not often you hear those deejays on an electronic and futuristic beat with a slow bass line and dreamy synths. Nightbird might be digital reggae, but it’s nothing like digital reggae. It has its own very contemporary sound complete with influences from the 80s reggae scene. Almost two years after the release of his Heavy This Year set French deejay and singer Taiwan MC returns with a second EP. Diskodub is an eight track effort and a hybrid of funky digital reggae and futuristic contemporary dancehall complete with psychedelic dub effects and a haunting melodica. The set is produced by Soap, Chinese Man, Dreadsquad and Manudigital with lyrics written by Taiwan MC when on the road. Each of this producers have their own distinct style, but it all blends together nicely. Taiwan MC showcases his tongue twisting skills on What a Joy and Tell Dem, the latter a version of Augustus “Gussie” Clarke’s successful Telephone Love. Album opener Diskodub closes with a high-pitched G-funk synth and Pon di Road borrows its guitar melody from Johnny Cash’s classic Ring of Fire. 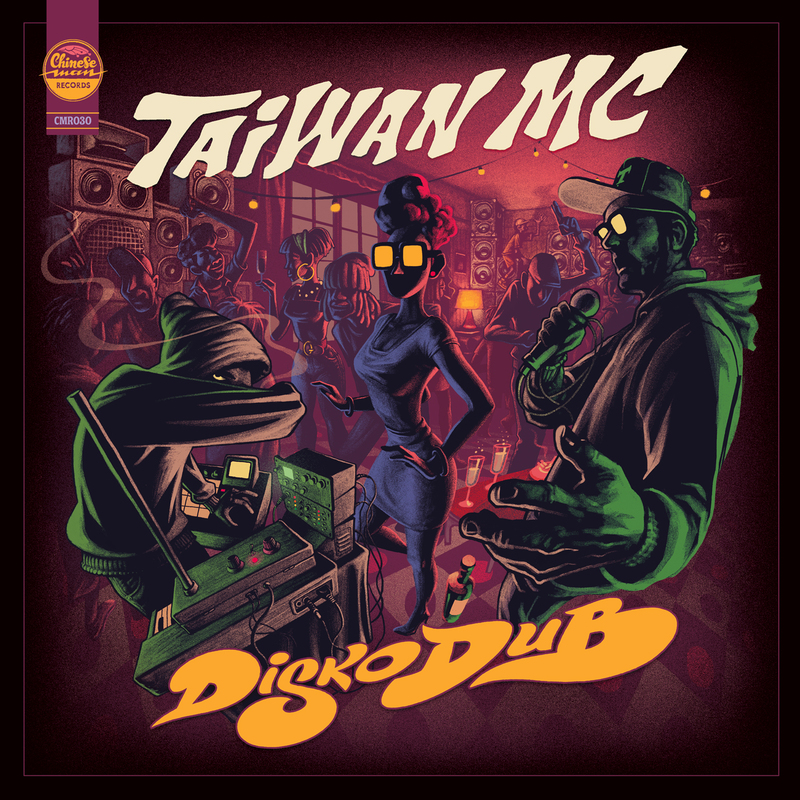 Taiwan MC also chats over a bouncy version of King Tubby’s brutal Tempo riddim and Manudigital’s remix of Blaze It Up pays tribute to the classic Sleng Teng riddim. The up-tempo and explosive Diskodub is an invitation to a digital reggae dancehall party. The legendary Papa Michigan – of Michigan & Smiley fame – has teamed up with Flash Hit Records and producer and mixing engineer Manudigital for a new EP titled DJ Legend. Michigan & Smiley were among the first deejay duos and begun their career in the late 70s, and soon scored two hit songs with Rub a Dub Style and Nice Up the Dance for producer Clement “Coxsone” Dodd. But their biggest hit was probably Diseases, which appeared on their successful album Downpression, produced by Henry “Junjo” Lawes. Michigan’s new set collects six brand new tracks, from rub a dub to digital, and drops in September.